Precision data given in the specified methods in this standard are to be used solely as a guide to the expected agreement between duplicate measurements of the property and are not to be regarded as tolerances applicable to the limits specified in Sheet 1. 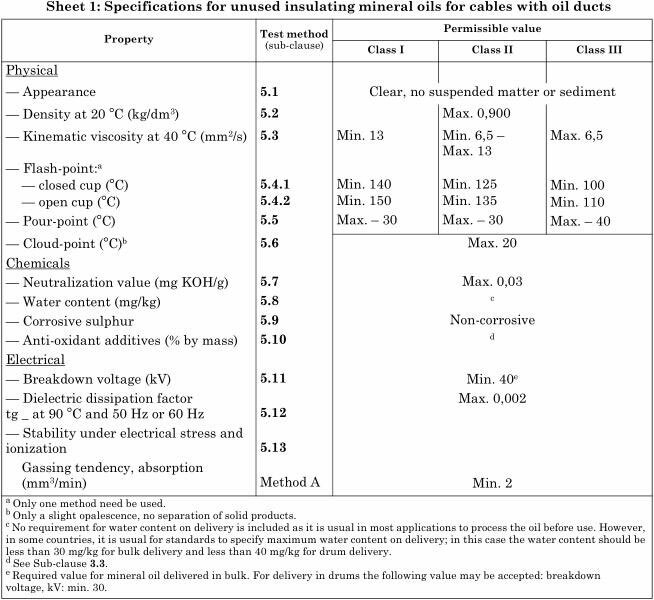 Mineral insulating oils for cables with oil ducts complying with this standard shall meet the limiting values specified in Sheet 1 when tested in accordance with the methods specified in Clause 5. These limiting values apply only to unused oil, as delivered, prior to its introduction into cable.